ROAD TOWN, Tortola, VI – Kyron McMaster, running at the Tom Jones Memorial Track and Field Meet at the Percy Beard Track, on Friday April 28, 2017 lowered his own National 400m Hurdle Record with another blistering run. McMaster comfortably won the race in a time of 48.69 to better his previous 48.71 set earlier this season, which also cements his current ranking as the second fastest in the discipline this season in the World. 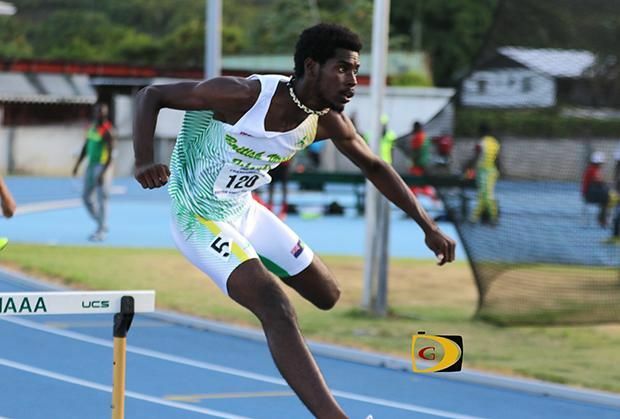 The event was held at the University of Florida, USA and McMaster easily held off the challenge from the rest of the field, with the second placed hurdler coming in at 49.19.
nobody can be the next usain bolt. he will be the only kyron McMaster. That boy is going to make it to the Olympics very soon. Shut up if you dont have nothing positive to say. How about, "Keep up the good work,"
You do realize this is track and field where only nerves and health will undo you. His time is second fastest in the world regardless of who he runs against that stands for something. This is not Basketball where you have different division of college programs so you may dominate D-II but cant get playing time in D-III. The only thing that would keep him from doing the same against anyone else is his health and his mind. The guy placed third, (although he was second, but got passed in the end) in the U20 WORLD CHAMPIONSHIPS in 2016, so what bigger meet is there with quality athletes that you need to rate him? People in this country only like to support their own when they make it big, I guess. How about grooming and funding talent like other Caribbean islands? Don't be quick to think that this is a BVIslander who made that foolish comment. We have a lot of people hiding behind devices and falsely blogging under that guise. Why can't y'all just congratulate him rather than oh u want to see him run with big atlethes myomy heavy heart people. Congratulations young man make yourself an your family proud.